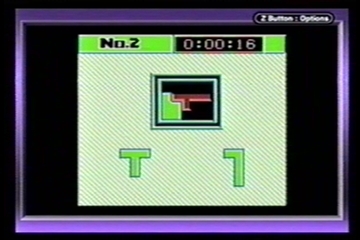 Picture a normal game of Tetris, with the pieces coming down from above and you arranging them into lines below. Then, picture that, instead of the pieces falling from above, you have the pieces available to you on the side of the board, from where you can select them, rotate them and place them, to make lines with them. Sounds easy, yes? Well, picture that your Tetris box is now, say, 8x10 squares big, or arranged in some odd dungeon-looking arrangement, and that you have to somehow figure out how to arrange all of your pieces so that they'll fit perfectly into this area, covering everything and not overlapping. Doesn't sound so easy any more, does it? This brings us to the main goal of Daedalian Opus. Basically, each "level" is a box, or some arrangement of an enclosed space, and you're given a certain number of pieces. Your goal is to figure out how to arrange all these pieces into this space, so that the entire space is covered and none of the pieces overlap. While this may sound simple at first, some of the stages can get very difficult. The stage layouts can range from simple boxes, to complex maze-like arrangements. The pieces can be rotated, as well as flipped to the other side. The main downside to the game is, sometimes the puzzles really can get too difficult, and there isn't any help in the game. While you can find some partial guides available online, especially if you don't want to use that, sometimes it can be very difficult. It would've been nice if there was some sort of in-game help, even just something slight like placing the first piece for you or something. Still, games don't always need to be made easier, and this one certainly can get your brain going for quite a while. The game's graphics are rather bland. It was an original Gameboy game, and, even with playing on a GBC or GBA, there really isn't much added in the way of colors or anything. Your play field is centered in the middle of the screen, with your pieces around the outside. Aside from that, though, there are no designs or other things to catch your attention on the screen, just a plain solid background. There are little animations which are played at the start of the game (along with a small story) and between levels, which is nice. 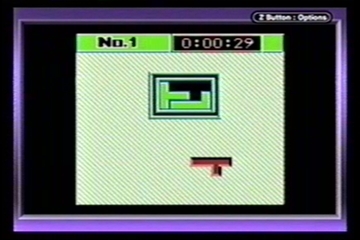 It's hard to be too harsh on the graphics, being not only an original Gameboy game, but one of the earlier ones, having been released in 1990. Still, aside from the pieces, and the little animations, there's basically nothing extra. It works fine, but, that's about it. Same with the background music, it's there, it works, but, it's nothing really special. It's a puzzle game, it works fine for that, but, it's not really catchy like Tetris or anything, it's just there. The story isn't too much to speak of either (it is a Puzzle game after all, story usually isn't a major element), but, at least it's something. Aside from that, though, it's pretty much just you and the pieces. Saving is done by passwords. These passwords are 4 letters in length, and are common words as opposed to a jumble of letters. So, that works nicely. While a battery save might've been nice, that wasn't really common at the time, and so, it's not really that big of an issue. Just make sure you keep your passwords someplace where you won't lose them. There's also a Stage Select password, which if you want to find it online, will allow you to forgo writing down the passwords and just skip to whichever level you left off with, which is nice. The game has 30+ puzzles (won't give the exact number so as to not spoil the fun of that, but, just to give a general idea), and, as mentioned, some of them get very tricky. So, you'll have your hands full for a while trying to figure out all of them. In the end, what you have is a fairly plain, straight-forward puzzle game. Which isn't necessarily a bad thing, it's not like puzzle games really need all sorts of dressing and stuff trying to make it fancy. Just, unfortunately, the gameplay can get a bit dry at times as well. The main idea is fun, and it will certainly get your mind working, trying to figure out all sorts of ways you can make the pieces fit together. Just, especially if you really get stuck, at times it can be no fun, just sitting there, looking at the board, not even sure of where to start. As well, while there are a decent number of puzzles, it would've been nice if there had been a bit more. Of course, with getting stuck and trying to figure things out, at times it might not even seem like it will matter, since you might feel you'll never even get past the puzzle you're on. Still, it's nice to have a good challenge from time to time. For anyone who likes puzzle games, and wants something to get their brain working, in the end, this really is an entertaining little game, definitely worth at least checking into if you ever have the chance.